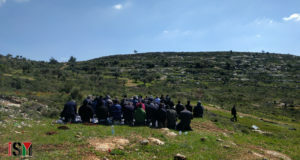 On Sunday 25 May 2008, local villagers, estimated at well over 100 people, accompanied by international and Israeli observers, representatives of the media and human rights workers converged this morning on the village of Ni’lin, west of Ramallah, to demonstrate at the theft of yet more village land by settlers from two nearby illegal Israeli settlements. They attempted to block the path of two bulldozers which were at work marking the new boundary of the Nili and Nala settlements. When completed the encroaching settlements and expected road closures will totally isolate the Palestinian villages of Ni’lin, Mediya, Shookba, Shabteen and Budrus. Residents will then be forced to exit and enter their villages via one strictly controlled access tunnel, making their lives even more difficult than they are today. The construction underway will serve as the course of the illegal apartheid/separation wall which will further isolate villagers not only from their own land but also access to surrounding cities. 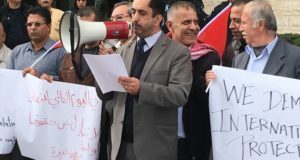 The protesters were dispersed by armed border police and members of the Israeli army who resorted to the use of force, including tear gas and sound grenades. A young Scottish woman working for the Palestinian Medical Support Team was slightly injured when struck by a tear gas canister detonated at close range. A number of arrests were made and a local man was taken to hospital by ambulance. The extent of his injuries are not yet known. 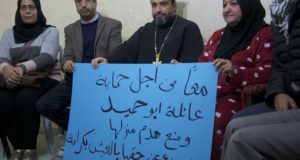 The villagers’ determination to resist the continuing theft of their lands seems to be undaunted and further protests are planned.